Dr. Melina Roberts is an author, a speaker, Naturopathic Doctor whose been in clinic practice for 14 years, and the founder of Advanced Naturopathic Medical Centre. Over the years she's learned a lot about this topic of “Detoxification”. She's learned about this topic from an academic point-of-view, understanding the science of detoxification, and as a doctor, seeing it work in clinical practice. It wasn’t until she understood detoxification at a deeper level and understood the system that needs to be followed, that she was able to take her patient’s health to the next level. Have you ever wanted to do a detox but weren’t sure which program to follow? Or you’ve followed a detox program, but felt like crap on it? Have you been exercising, eating healthy, you feel like you are doing everything right, but you still aren’t reaching your health goals? Are you struggling to reach your health goals and take your health to the next level? Then DETOXIFICATION may be the missing link! And it may be that you are not implementing the right plan, in the right order to get optimal results and reap the benefits of detoxification. We live in a highly toxic world! It makes sense that toxins are making their way into our body and affecting the proper function of different system in our body and every cell in our body. In order for us to move our health to the next level, we need to be able to safely and effectively move these toxins out the body. We do want to try to avoid toxins coming into our body. We also want to make sure that we can effectively move toxins out of our body. Therefore we need to work on improving our pathways of detoxification. 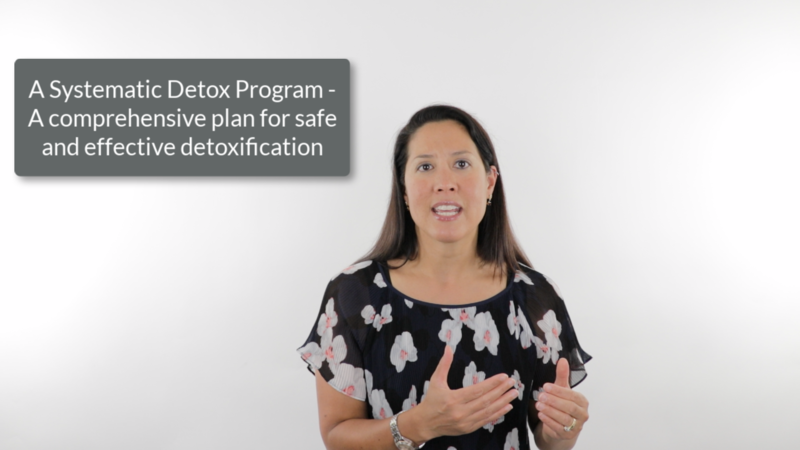 There’s a lot of different detox programs on the market today, but most of them have problems or challenges which don’t make them as effectively as they could be. 3. Ability to absorb nutrients: If we are unable to properly absorb nutrients from our foods and/or supplements then we cannot reap the benefits of diet or supplement plan alone. 4. Programs that mobilize toxins, but do not effectively move toxins out of the body. 5. Extracellular toxic build-up. This will affect our ability to move nutrients into the cells where the detoxification pathways operate. 6. Intracellular toxic build-up. This will affect our cell’s ability to operate detoxification pathways. We need a systematic approach to proper detoxification. That’s why I developed “A Systematic Detox Program: A Comprehensive Plan for Safe and Effective Detoxification”. This course is a FIVE-Part e-Course. Where we are getting exposed to toxins and ways to limit or decrease our exposure. Healing the digestive tract, eating the right foods, supporting a healthy microbiome, healing the lining of the digestive tract, properly eliminating and having ideal stools. We need to start with the primary emunctories and make sure they are open and flowing well, before we can work in the secondary emunctories, in order to support the proper pathways of detoxification to obtain optimal results. In order to have effective detoxification, we need to support detoxification pathways in the correct order. We need to follow the detoxification pathways in a systematic way to optimize results. This will be a 12 week plan that is outlined with supplements, doses. I’ll walk you through each step so that you are able to get the optimal detox results and easily be able to implement this plan. I was told that people would pay thousands of dollars to get ahold of this plan. We priced this course at $197. EXTRA BONUS: Access to PRIVATE Community with Dr. Roberts and fellow students for an ENTIRE year ($2495 value). Ask Dr. Roberts, author and leading authority in the field of naturopathic medicine, anything you want! She's in the private community forum every week taking your questions! ADDED BONUS: Get a FREE Healthy Home consultation with environmental engineer Emma Rohmann of Green at Home. In this 30min phone consultation ($75 value) you will learn how you can effectively detox your home, with specific product recommendations based on your health goals and lifestyle. That's $2854 of value and training! ....BUT today you get ALL of this for just $87!! If you don't love it, ask for your money back within 30 days. No hassle, no worries. A comprehensive plan for safe and effective detoxification. This course is a FIVE-Part Video Series.